Its Not What You Do, Its The Way That You Do It! An excellent choice for events on a budget or when a quick set up is required. The square helter skelter is available for around half the price of the Lighthouse type yet stills gives a massive amount of fun. 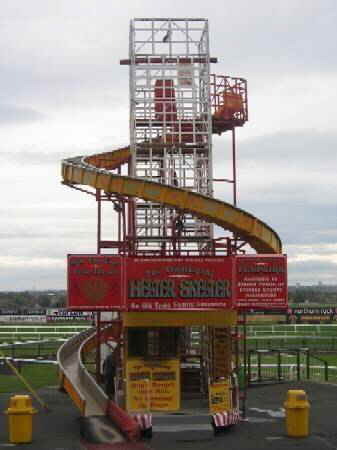 Almost 40 feet high (12.1 metres) climb the tower then whizz down the slide. Perfect for any age group, this attraction can be erected in around 3 hours. The tall square formation lends itself perfectly to being branded for corporate events or product launches, imagine your advert 40 feet in the air. 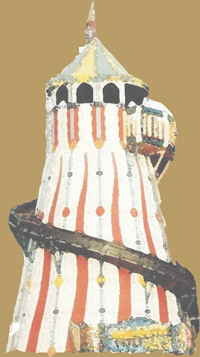 When only the biggest will do, you need the giant lighthouse helter skelter. Please bear in mind that this type of attraction requires around 10 hours to set up and requires a large construction crew so it is only suitable for the biggest events.